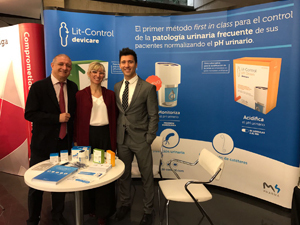 M4 Pharma and Devicare participated in the 20th Symposium of the Catalan Society of Urology, held in Barcelona on 31 March and 1 April, with a stand dedicated to Lit-Control® medical devices and food supplements for in-home self-management of frequent urological pathologies through a urinary pH Meter. 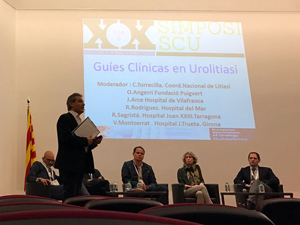 practice moderated by Dr. Carlos Torrecilla (Bellvitge University Hospital) and with the participation of Dr. Oriol Angerri (Fundació Puigvert), Dr. Jacobo Arce (Hospital de Vilafranca), Dr. Roy Rodríguez (Hospital del Mar), Dr. Rosa Sagristà (Joan XXIII University Hospital) and Dr. Vicenç Montserrat (Dr. Trueta University Hospital). The debate sought to unify criteria and compare proceedings in the treatment of lithiasis in Catalonia. Among many aspects, the experts emphasized that the composition of kidney stones must be analysed before treatment with instruments and insisted in requesting a study of the metabolism and urinary pH of patients in order to avoid early lithiasis relapse, which is at around 30% (and can reach up to 50% five years after the first bout of the disease).